Label Rouge turkeys are reared outdoors and offer the consumer a superior level of quality, especially for cut products. Hardy breeds, with bronze colored feathers, selected for the quality of their meat and their slow growth. Turkeys are raised in little flocks in small, well-lit poultryhouses in natural daylight (400 m² maximum). The maximum stocking rate allowed inside the poultryhouse is 6.25 turkeys per m². 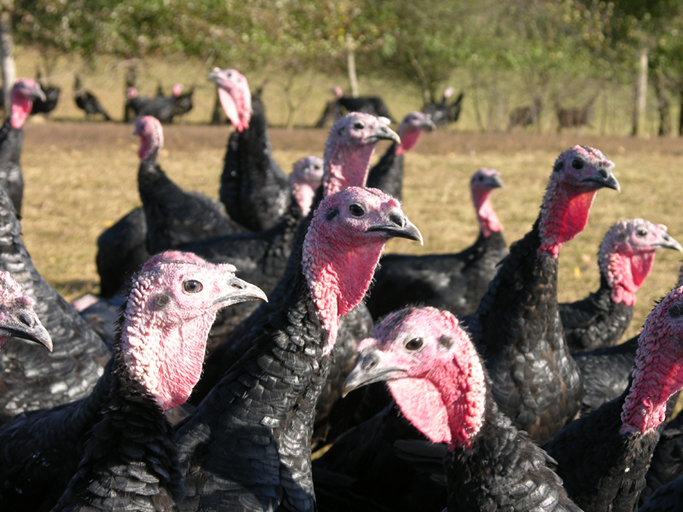 They are allowed to freely roam on grassy and/or shaded areas (6 m² minimum per turkey). At least 75% of their feed during the fattening period must contain cereals and cereal-based products. Label Rouge traditional turkeys reared for cut meat are not slaughtered until they reach an age of at least 126 days for males and 98 days for females. Filet to roast: meat from the breast muscle (can be presented surrounded by lard). 14 days maximum after slaughter for cut pieces vacuum packed or presented in modified atmosphere packaging (or gas-filled packs).